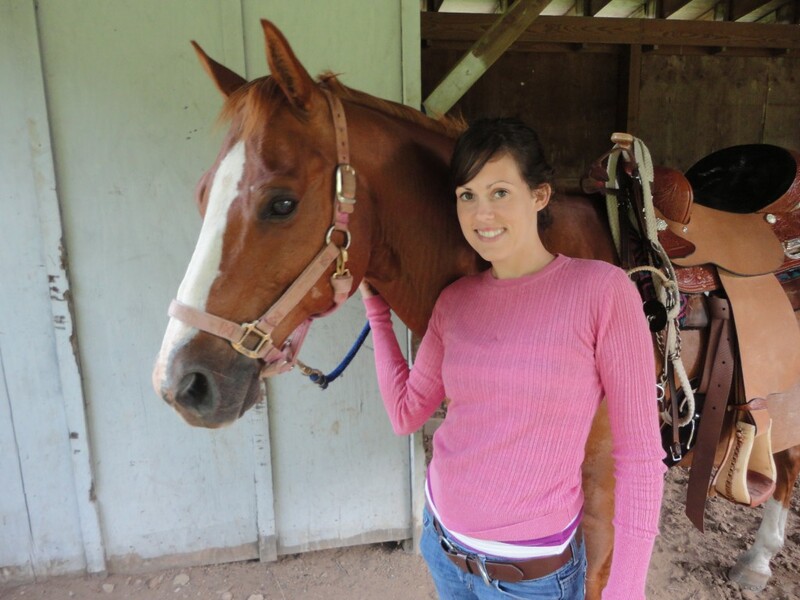 Last year, at the end of 2015, I bought a new to me living quarter horse trailer. The hubs had started to go on camping trips with me and was enjoying it, so I decided it was time to upgrade my horse trailer. My old trailer was great when it was just me camping but with him tagging along, I wanted something with true living quarters. He doesn’t ride horses, despite me begging repeatedly, so I knew I needed something that he could hang out in while I ride and not get too bored. 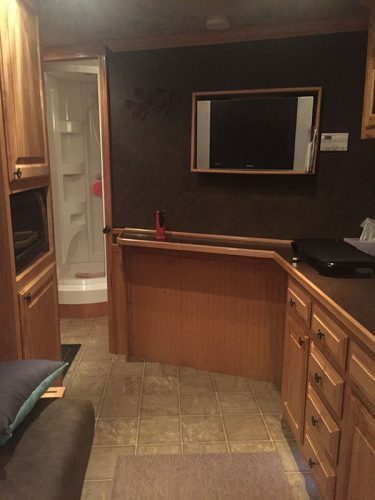 So I started looking for a used living quarter horse trailer…. 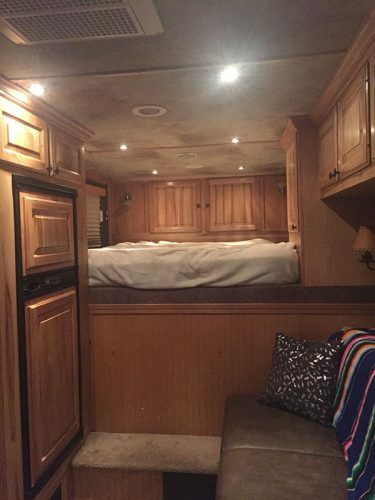 Then one day, I found the perfect horse trailer with the most amazing living quarters I had ever seen! I called up the owner, went straight to look at it, loved it and made the arrangements to buy it that day. Never once did I get buyers remorse over making such a large purchase so quickly and still to this day I love spending time in this trailer. If you asked me would I live in it, I’d say yes! Now that I’ve owned it for a while I feel like I have a good idea of what makes buying a living quarter trailer worth it and what doesn’t. You have the Cash to pay for it outright and don’t have to take out a loan!!! This one is big y’all. If you can’t do this, don’t buy one. I’ve always been a big Dave Ramsey fan and have worked hard to be debt free. When you buy big ticket items like this with Cash, you appreciate them better and take better care of them. These trailers are expensive and need the best care so they will last years and years. 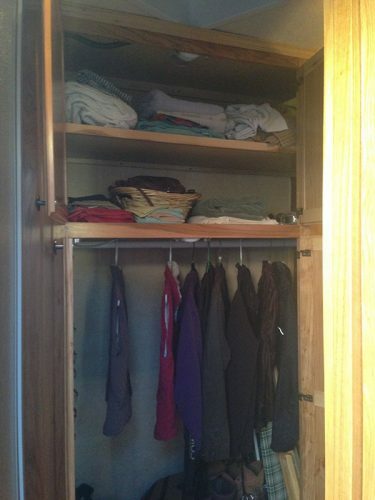 More “living space” then a regular trailer – My trailer has 15′ of living space which is plenty of room for both of us. We’ve never felt cramped in it. I also have tons of cabinet space, so much in fact that I still have empty cabinets because I don’t have any need to put anything in them. Not having to use a bath house – Gah, I love not having to use a bathhouse anymore. I’ve stayed at some horse camps where the bathroom was just gross. You would take a shower and still feel as dirty after as you did before the shower. 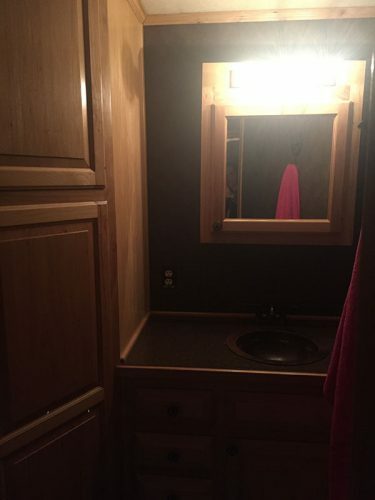 Now I can shower in my trailer. Not to mention, having your own toilet in your horse trailer. OMG is it the best! 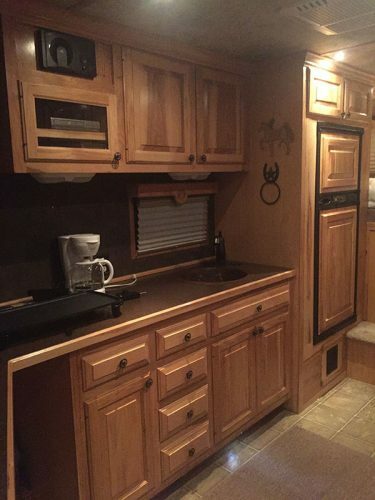 Cook inside the trailer – I typically do not cook in my trailer and if you’ll notice in the pictures, my horse trailer doesn’t have a cook top. I’m not a fan of cooking inside or having one more appliance to worry about something going wrong with. I’m also worried about it being left on and causing a fire, among other fears, so I purposfully bought a trailer without that feature. However, I do understand why people want this, especially when it rains, which is why I’m including it as a Pro. 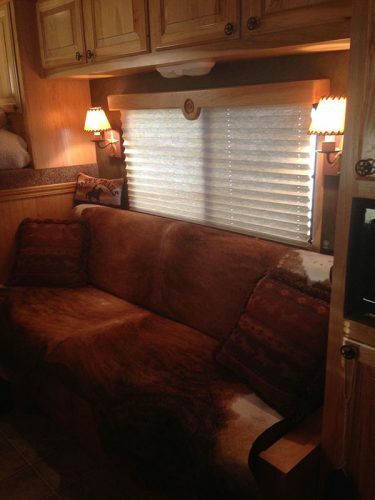 Sleeps more people – Most living quarter horse trailers have a couch or table that fold into a bed. This gives you room for additional people to camp with you and have somewhere to sleep. I love that I can now invite friends to go camp with me and we can take one trailer. It saves us both money on camping fees, food, and gas because we can split everything! Self Sufficient – this will apply to some trailers but not all living quarter trailers. When I say self sufficient, I mean you can camp without having power and water – i.e.Primitive Camp. Some living quarter trailers have generators which can run most of the appliances in the trailer. I believe all LQ trailers (although don’t quote me on this) have a holding tank for water. Which means you can fill it up and still use the sinks, shower, and toilet. Big Expense – not only is buying the trailer an expense but depending upon what all your trailer has, there could be additional expenses, such as – generator maintenance, fixing leaking water tanks, propane tanks to fill, winterizing the trailer, appliances to maintain, etc. 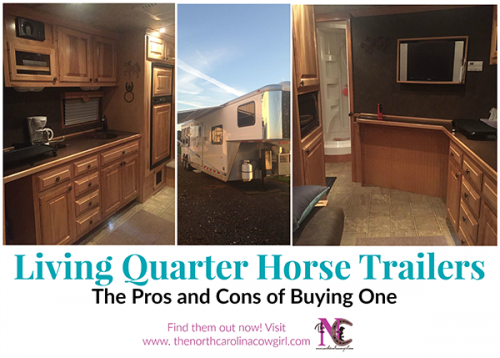 Make sure you know all of the costs associated with having a true living quarter trailer before you buy one. Those are costs you won’t have every time you use it, but they are costs that will come up and you don’t want to be surprised by them. 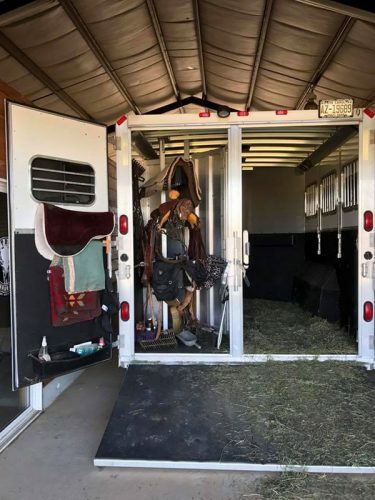 LQ Horse Trailers are Heavy – in some cases, owning an LQ trailer could mean you need to have a dually to pull it and the right weighted tags. Make sure when you are looking at these bigger trailers, you find out the empty weight and loaded weight. I actually took mine to be weighed so I’d know how heavy it is. With a horse in it and fully loaded for camping, my trailer weighs 16,000 lbs. Have to be Winterized – this isn’t anything big and shouldn’t stop you from buying an LQ trailer. If you do it yourself, winterizing your trailer will cost you less than $20. Maintenance is costly when things break – For example, leaky tanks can be costly to fix/replace and this is something that has to be done if they leak because campgrounds don’t allow anything to leak out. Some other costly repairs that I’ve heard about but not dealt with are – water draining issues, water pipes breaking, roofs leaking and needing repair along with making sure the inside doesn’t mold, etc. having a hydraulic jack is the best. No more hand cranking the trailer. However, I have already had an issue with this and was unable to get my trailer onto my truck because the jack messed up. Had I have been camping, I would have been screwed. being self sufficient and not needing water and electric hook ups. I love that I can go to shows and still fully use my trailer…especially all day shows. 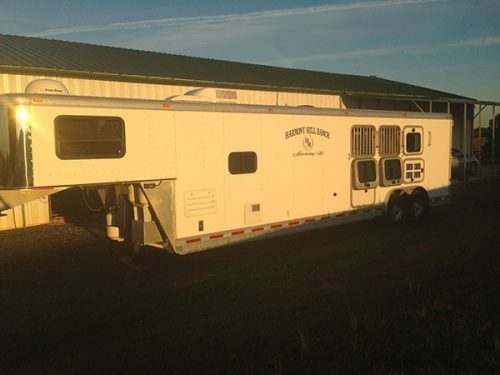 What are some of your pros/cons for buying a living quarter horse trailer? 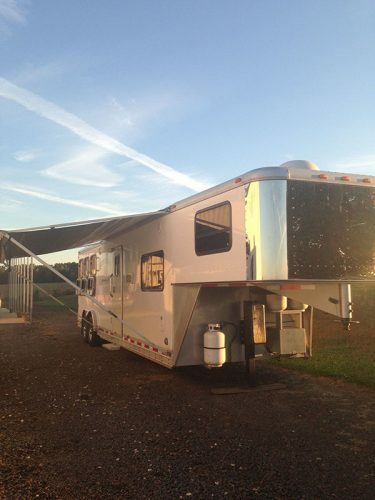 What features do you love about your trailer now? We are thinking of upgrading our trailer, it is a 3 horse with a 7′ short wall. Curious how that big of a trailer tows. Not concerned with weight but more cornering etc. It’s definitely not easy but I haven’t had any problems turning anywhere…YET! This is some really good information about horse trailers. I didn’t realize that you could get on that has a living quarter attached to it. I also like that you explained that you can get a separate place to keep your saddles and other equipment in a trailer like this one. Thanks for the info.I’m in the process of ordering a trailer now. I have been working with a dealer and Lakota on getting the thing set up just the way I want it. I know there “WAY” more then a standard RV but you get something that can last a lifetime. But in talking with the builders I have discovered some information for people to think about when getting one. #1: Nearly all of them will only give you 120 VAC when plugged into shore power. This means no TV, no microwave, no AC if you have it. The only way to have this is by bringing a large enough generator or getting one that has it on the roof. #2: If you get one with a generator, be ready for a Propane hungry monster. The Propane generators will use up a 30 pound tank in 18 hours. So if you can afford it go Diesel. But this has some problems on it’s own. The big one it the cost. Around $18,000 compared to $8000. Then you have the fuel tank in the back. Some place under the manger, some in the tack area. They also are 460 pounds VS 260 LBS. Not to the benefits of Diesel. A 20 gallon tank can run for 48 hours and run 2 AC units with plenty to spare. If you are only running a light load of power you can get well over 72 hours. #3: battery power. 12 VDC for lights and what not’s. A LQ trailer will only come with a “converter” This is only to charge the batteries when plugged in. And if you are using standard wet led acid ones then you had better charge them for at least 3 days before going on a trip. You are only going to get around 18 hours of power depending on how many times you have drained them. Never go below the 50% mark. If you do then you shorten the run time by nearly 1/3. But there is good news. There is now a drop in 12 Volt Lithium Ion Battery. You will get sticker shock from them but they actually cost less in the long run and you get way more from them. One thing is you can charge them in 4 hours VS 3 days to get them fully charged. Now back to the converter. If you want to run something like a TV when Boon docking you will need an “inverter” to turn DC into AV voltage. But this brings along a couple of other problems and another peace of equipment. You will also need a transfer switch so you do not blow things up when you plug the trailer in. #4: They do not have rear jacks to level out the trailer. So you must have something to drive it on just to get it close. Otherwise the refrigerator will not work as best it can. Since I’m just in the ordering process I will look into finding some that Il hook up to the hydraulic jack system. Yes it will take some modification and a couple of valves but i think it will be well worth it in the end. Last but not least is that big roof. If you has an aluminum roof VS the white honeycomb fiber glass one. Not each one has a pro and con to them. That full sheet of shiny aluminum. Pros: Less chance of a leak and much easier to fix if there is a leak. Also it can last a life time. All you do is make sure the calking is good. Cons, It get hot in the sun. Real hot. I’m talking MC Hammer, You Can’t Touch This type of hot. So if you need to work on it be ready to be blinded and sun burnt. The white fiber type of rubber type. Now if you get a Cimmeron you get a honeycomb type made of fiberglass, but others might have a rubber type of coating over them. Pros: Less heat transfer and quiet in a hard rain and they can talk larger hail stones being tossed down at them before getting a dimple. Cons: If you have the rubber coated type be ready to re place it every 5 to 7 years. That means sending it out or doing it your self. Now since I’m getting mine with out ever looking at it I have no idea what color it will be. But since I’m it, I can get a couple of things changed so it will be ready for full time off grid use. I have found that you can get a builder like Lakota to make what you want to a degree but you must stick within there engineering. It’s always a trade off when it comes to a trailer If you want X then you must be ready to give up Y. If you want Z then you must be ready for W to change. So this is my experience so far in the process. It has taken me 4 months of working back and forth to get what I need not what I want. At some point I might start a blog about what I have gone through, but tell then I’ll just stick with my off the wall YouTube channel. I’m sure it will get changed over to a full time living in a horse trailer channel at some point. Wow, that’s a lot of great info Marty! Thanks for sharing it!